Port from 286+/VGA to 8088/CGA of Dírojed by Řrřola (http://www.pouet.net/prod.php?which=28913) while remaining 32 bytes. Due to size limitations I had to change the exit key from Esc to Ctrl+Alt+Del, and you get a reboot for free. Live video from the party (thanks to Deltafire). More info and greetz in the .nfo. was it port or blatant rip? Hoi hoi hoi. 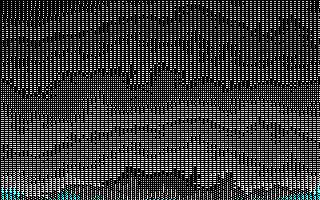 CGA. 8088. Hoi Hoi Hoi! g0blinish: Compare the codes and decide for yourself! I did start from Řrřola's code but only 1/3 of the instructions remain unchanged. Also the constraints are so tight I would probably have ended up with the same code even if I tried to implement the same algorithm from scratch. Cool, not too many CGA prods around. More and more 8088 entries, keep it coming! It's a classic 32b, and looks good in CGA. I recommend watching on dosbox (or real hardware of course :) btw, since the youtube doesn't do it justice compared to what I saw at the party. The 'dither' pattern was really neat. I don't know ... i looked at the codes, and it is basically the same. Changes are of cause due to the different screen mode, but otherwise, same concept, same cellular automaton, even same pseudo random value. The flow is a little different (XCHG) but you lost the "ESC" function. Also, i instantly see a 1 byte improvement ... so what do i do here? nice looking 32b. also looked nice at the stream. so here is my thumbs. Well, actually it seems not to difficult to hack the CGA mode into Rrrola's original, while keeping the possibility to quit with "ESC", and also keep the filesize at 32 bytes. mov bh,0xb8 - of course! 3 more and I can put back the Esc functionality... In my defense, I stopped looking for optimizations once I reached 32 bytes. Yes, it is very derivative of the original Dírojed and I never claimed otherwise. But it is a party hack, and it's about as different from Dírojed as Dírojed is from Lochfrass. HellMood: The original point point of Dírojed CGA was to run on my XT so I can't use that "imul bx,byte 0xe5" instruction. Nice work though! line I can put back the Esc code and keep it in 32 bytes and working on an 8088. I just get diamond shapes growing down instead of oval shapes growing in all directions. Nice idea! Congrats on the 3rd place. You don't really need the imul - "inc bp, sbb bx,bp" saves 3 bytes and looks similar. See the Kristal source for some Dírojed tweaks. @rrrola: Oh wow, that is some insane and brilliant code! I was wondering the other day if it would be possible to overlap the initialization code with the start of the loop to get save some bytes. This random number generator is great too. As are the "xchg ax,cx; loop", "imul si" and "xlatb" tricks. , recycling the 0xb0 opcode from the initial "mov al,4" instruction as the high byte of the segment. This discussion thread alone deserves a thumb. Awesome. I feel like I'm observing some new life form. I'm going to be very still and observe its habits. Is it me or does this look better in composite? Was that the intent? Watching on Tandy 1000HX. page created in 0.017399 seconds with 15 queries.